POSTED: Tue, 01/17/2017 - 17:00 | POSTED BY: Traci C.
The long-awaited Planet Hollywood Observatory is slated to open sometime next week. There's no official opening date yet, but guests can reportedly make reservations for times beginning on January 22. The restaurant has been closed for almost a year, and the renovated spot will look like a 20th century observatory. 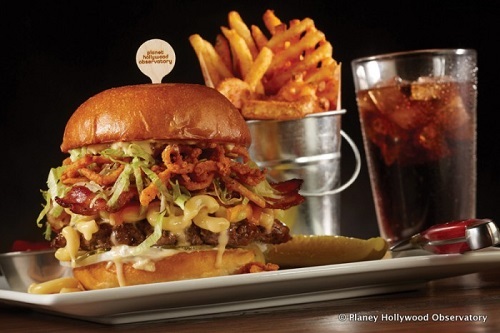 The new menu will feature gourmet burgers created by celebrity chef Guy Fieri. Disney is reportedly adding anti-theft devices to merchandise at the theme park stores. If you're visiting Epcot you'll notice that the totem poles in the Canada pavilion are being replaced. Artist David Boxley (who created the original totem poles) is doing the work and the new totem poles will reportedly be dedicated on January 21 and 22. Guests with reservations at Walt Disney World Resort hotels are now receiving the new MagicBand 2 when they have their MagicBands shipped to their home. The MagicBand 2 will be available at resort hotel front desks after February. And in corporate news, Disney CEO Bob Iger took a $1 million pay cut last year. But he still made $43.9 million. Iger is also reportedly looking for someone to write his memoir. The current odds-on favorite is two-time Pulitzer Prize-winner David McCullough. Are you excited about the reopening of Planet Hollywood as the Planet Hollywood Observatory? Let us know in the comments.